Did you know both the 49ers and the Ravens have a team Chiropractor? In fact, pretty much every NFL team has their own Chiropractor. Many of the Chiropractors do most of their work before the game. Players get adjustments, which may just be on their knees, shoulders or ankles because "they feel it is a more proactive approach so it prevents injury from occurring." "Their job is to get banged and be tackled," said Dr Miller, who is the Ravens' team's Chiropractor. "They are basically getting beaten up each game. They understand the importance of a Chiropractor and see how it allows them to play longer." It's true: You can prevent disease and illness before they strike. How? By following the chiropractic lifestyle, a way of life that focuses on health-boosting activities and strategies. The chiropractic lifestyle begins with regularly scheduled chiropractic visits to ensure your nerve system is functioning at 100%. When spinal movement is restricted or spinal bones (vertebrae) become misaligned, the result is a common condition known as subluxation. Your Chiropractor corrects subluxations with safe and gentle maneuvers called chiropractic adjustments. Don't wait until illness or disease strikes to reevaluate your health habits and make changes! Talk to us today. Together you can map out a health-boosting strategy, which includes regularly scheduled chiropractic care, bushels of fresh fruits and vegetables and plenty of exhilarating exercise. When the flu season hits, many parents will be reaching for the cold compresses and medication to cool their feverish child. 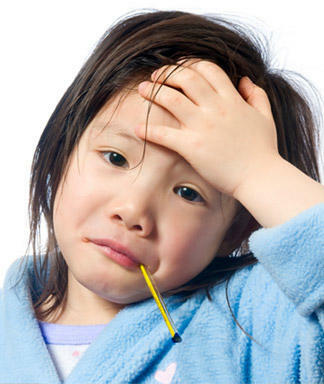 But it seems a high temperature could actually help children battle an illness. An American pediatrician has revealed the high fevers typical of many childhood illnesses can help force a child to slow down, rest and sleep more - all vital in recovering. 'Fevers can actually help your child recover more quickly, especially if he or she is battling a viral illness. Parents are advised to seek medical help if a child's temperature reaches 104F (40C) or above. Fortunately most fevers are caused by a viral infection, and clear up on their own within a few days. While it's best to be at a healthy weight for your body, Lee thinks her team's analysis demonstrates that every bit of activity helps, regardless of a person's size. "This shows if you emphasize physical activity, you still get the benefit," says Lee. "Overweight, obese, severely obese - if you are active, the results suggest that you have more of a benefit than someone who is not heavy but not active." The World Health Organization's recommendation that adults should get at least 150 minutes of moderate to vigorous activity a week.